Last year in 2016, Lissome hosted a three-part event series in London called “Threads: Rethinking Fashion”. At one of these events, Stine Sandermann and I met for the first time: Stine was an MA student for Sustainable Textile Design at Chelsea College of Arts, and eager to learn more about an ethical and eco-innovative approach to fashion design. Since our initial meeting, she has graduated successfully and returned to her home country of Denmark. Stine is now running her own fashion brand and defining her very own way of working mindfully with a strong focus on intelligent waste management and zero waste production, and her effortless yet artful designs are inspired by the cultural heritage and history of her native country. Stine, could you tell me about how you started your brand? My eponymous brand is called SANDERMANN, and it focuses on sustainability and ethics within every step of the supply chain. Our centre of interest is “rethinking waste”. We only use locally sourced waste materials – and transform them into something new and valuable. My path into fashion design started when I took a preparatory course for the Danish design schools in 2010 at the Scandinavian Design College. This 6 months course convinced me to study fashion and textile design. I fell in love with the endless possibilities within the artistic process and the fact that no idea was too wacky. During my BA and MA studies, I held onto this approach, which then differentiated me from my peers. Somewhere along the way, however, gaining greater insight into the fashion industry, opened my eyes to the current environmental and ethical issues. Being aesthetically different was no longer enough - I also constrained myself to think about the origin of the materials and the ethics of it all. I realised that I could only have 100% control if I started my own brand. And here I am today. Why is a conscious approach to fashion important to you? After seeing documentaries like “China Blue” (2005) and “The True Cost” (2015), I couldn’t go back to conventional fashion. In my opinion, conscious fashion is not a choice, it’s a must, and I think, if you start a brand in 2017 and you do not work sustainably on some level, your brand won’t survive. I started my own fashion brand because I’ve known for a long time that I wanted to be an entrepreneur. I knew I wouldn’t be happy working as a designer for a big brand unless it shared my values and aesthetics. And very few larger brands do. What are your design influences, who inspires you? My go-to contemporary role models are designers like Manish Arora and Iris van Herpen, but their collections vary and so does my interest in them. Studying Elsa Schiaparelli and reading about her story and her work will always inspire me. In general, I’m influenced by nature, science, cultural heritage and art. Recently I saw an exhibition by Joana Vasconcelos which blew my mind - it motivated me to do something more colourful and detailed in the near future. My journey in using waste materials started when I discovered that many Danish sheep farmers burn the wool every time they shear their sheep. Your focus is on ‘rethinking waste’ - what are your strategies? My strategy is to create a local collecting system – for wool but also for other materials. My dream is to have a “centre” for collected wool, yarns and fabrics, and then to integrate these random materials in my collections. Recently, I’ve started sourcing deadstock fabrics from the remaining textile industry in Denmark because I needed to be able to create an entire outfit instead of just sweaters, coats etc, and I also wanted to take seasons and the weather into consideration. And I found out that there are loads of those deadstock fabrics available. What sparked your interest in working with ‘waste materials’? My journey into using waste materials started when I discovered that many Danish sheep farmers burn the wool every time they shear their sheep. By law, they are obliged to shear their sheep at least once a year. They burn the wool because the sheep are bred for their meat or because the farmers keep them for grazing large areas of land. The quality of the wool, therefore, is not a priority and the fibres are often quite coarse. A lot of wool is going to waste because the farmers see it as a burden. It is important to me to go back to using local resources, especially if they’re discarded, instead of having to import them from Australia, New Zealand or China. I also value animal welfare highly. I’ve heard many stories about mulesing and the violent shearing of sheep - so when I collect the wool I check and make sure the animals are well. To me, there’s a great value in having seen with my own eyes where the fibres come from and in being able to communicate this to my costumers. You name wool as your favourite material - what do you love about wool? After working with wool for some time now, I’ve come to think that it’s the ultimate sustainable material. It’s renewable, it doesn’t need washing (naturally, it has self-cleaning properties), it’s biodegradable, it has natural elasticity and I could go on. And technique-wise I’ve only scratched the surface so far. Wool is so versatile: I can card it, felt it, spin it, knit it, weave it, use it for embroidery. When I work with wool, my process becomes slower and more meticulous than when I cut and sew garments, and I love that variation. We’re based in a small town with a long textile tradition. Back in the 70’s and 80’s, Ikast was the Danish textile Mekka - and a few of those factories have remained until today. Where do your different stages of production take place? All production is done in Denmark. Once the wool is collected from the farmers, it is shipped to a spinning mill on the island of Funen. When the yarns come back, they are knitted on a domestic knitting machine at our studio. In the future, I will have a larger scale production at a local knitting factory. Luckily, we’re based in a small town with a long textile tradition. Back in the 70's and 80's, Ikast was the Danish textile Mekka - and a few of those factories have remained until today. 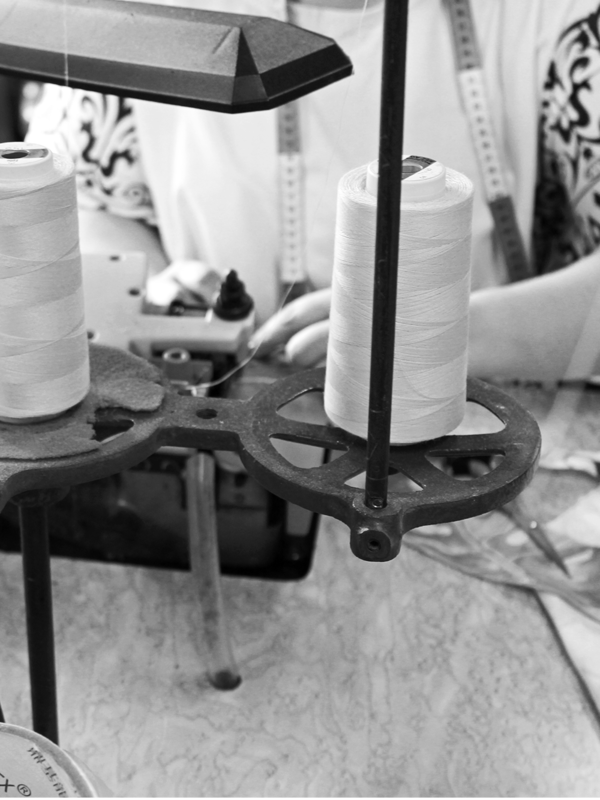 When I source deadstock textiles, they are cut and sewn at our own workshop. I am a part of an initiative called Sylab (“Sewing Laboratory”) and we have all the industrial machines and technical staff needed. The coolest thing about this initiative is that we’re developing a sewing robot, which will automate most of the sewing processes. So hopefully in the future, my garments will be made with cutting edge technology! Could you explain how you work with zero waste patterns? My interest in zero waste pattern design started during my MA degree at a workshop with Holly McQuillan. Holly is a zero waste design genius! This opened my eyes to the possibilities of good and thorough pattern design, and I’ve experimented with it since. It was ironic - she as a New Zealander, taught me, a Dane, about my own cultural heritage, and introduced me to the Danish Bronze Age Shirt and the principles on which it was made. This experience made me dive into my own cultural heritage and I discovered several historical dresses that are made with the zero waste technique. For instance, I used a Viking Coat pattern to develop the Sticky Dress. I’m still at an early stage, but I’ll definitely work with this approach on more styles. How do you envision the future of your own brand? The future is tough, but in the end bright! My dream is that SANDERMANN will become the leading sustainable fashion brand in Denmark. I would then have the possibility to share my knowledge, engage with new projects, learn new things and meet new people. I think success is when I can live a self-sufficient life by doing what I’m passionate about. Do you see yourself as a pioneer or part of a movement? Yes, I do. Even though Denmark is a frontrunner in solving environmental issues, I couldn’t believe that there wasn't any MA course in Sustainable Textile Design in the country. I had to go abroad to study in London for an MA in Sustainable Textile Design at the Chelsea College of Arts. What is your vision for the fashion industry: Do you have any ideas on how to turn mindful fashion into the new standard? I’m very ambivalent on this matter. On one hand, I think conventional fast fashion is the key to all evil in this industry and I would love for it to stop. In the short term, however, I don’t think that it will change and I think it’s better for us designers to change our own approach. Instead of us simply thinking “slow is better” and going against fast fashion, I think we should work with the system of consumerism and design products that are meant to be used and thrown away, in a way that they can be put back into the cycle – this is where we could integrate biodegradable and/or recyclable materials. But then, on the other hand, if you look at conventional food vs. organic food, organic food is much more popular in Denmark now, and the price difference isn’t even that high anymore. So I think that our behaviour will change in regards to fashion consumption, but it won’t happen rapidly. And then designers will again have to adjust. Thank you so much for the interview, Stine!